Anyone looking to snag a Windows RT tablet should hold off until Sunday, when at least one retailer will be lopping $150 off the base price of Microsoft’s Surface RT. Staples will be selling the 32GB Surface RT for $350 starting Sunday, July 14 until Saturday, July 20, as part of the retailer’s weekly promotional sales. But whether the Surface RT’s cheaper pricing is part of a larger, more permanent price cut or just a temporary drop for one model appears to be up for debate. The Staples price drop appears to confirm an earlier report by The Verge which said Microsoft plans to cut the prices for the 32GB and 64GB Surface RT. Except it doesn’t, really. Based on The Verge report, you will reportedly be able to pick-up the 32GB Surface RT for $350 or $450 for the 64GB model. If you want a Touch Cover accessory to go with either slate, add another $100 as you do now. But the Staples weekly ad makes no mention of a price cut for the 64GB model, even though the retailer sells that version of the Microsoft slate. When approached by PCWorld, Microsoft said it doesn’t comment on rumors or speculation. A price cut for the aging version of the Surface RT certainly wouldn’t be a surprise. If, as Microsoft claims, the Surface RT is truly a PC then a drop in price is long overdue. The company’s RT slate first appeared in October at the same $500 price you can buy it for right now. Nine months without a price cut is an eternity for a Windows PC, where slashed costs typically come mere months after a product launches. There are also expectations that new Surface models are on their way including rumors of 7- and 9-inch models. A next-generation Surface RT is also expected to come packed with Qualcomm’s new Snapdragon 800 chip, a veritable speed demon in the world of ARM-based chips. Then again, the Staples price cut looks like just another temporary sale in a long line of recent Surface deals. In late May, attendees of Microsoft’s TechEd conference were able to pick up a 64GB Surface RT for just $100 . Around the same time, Microsoft offered the rest of the world a free Touch or Type Cover with the purchase of a Surface RT tablet. In mid-June, Microsoft said it would offer its RT slate for just $200 for a limited time to universities and K-12 schools. So many fire sales in such a short time span do make you think a new model is barreling down the pipeline, though. 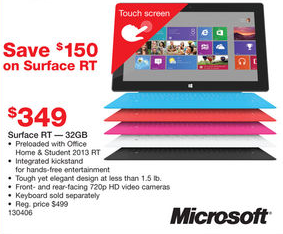 We’ll keep our eye out for more Surface RT deals from other retailers in the coming days. In the meantime, however, the only confirmed price cut we’ve seen is the Staples deal on a 32GB Surface RT for $350.